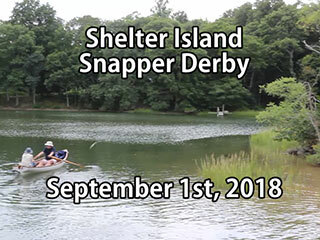 The 2018 Snapper Derby was held on Saturday September 1st at the Shelter Island American Legion. The Derby is one of the largest fund raisers on Shelter Island during the year. 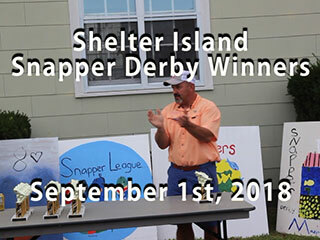 The Derby consists of two parts, a snapper fishing contest and a logo design contest. The Derby also marks the unofficial end of summer on Shelter Island. During the 2018 Derby, we saw a smaller turn out with a total of over 95 entries. Everyone had a great time fishing and enjoyed the great food that was offered. The snappers were small this season, the winning snapper had a weight of 0.895 lbs. Normally, the winning snappers weigh more than 0.90 lbs. If you missed the action, you can view the two videos of the current snapper derby. We like to thank all our sponsors that made this event a great success! Please visit our sponsor's page and become a sponsor for the event. The money that will be raised will go to local charities. Have a great Summer fishing!! Please remember if you would like to have your Snapper Derby photos to be posted, send them to us. This web site has been up for 10 years now and we have received just eight photographs from the parents. Does this mean that no one is taking photographs of their kids fishing. It so easy to take a photo with a digital camera today!